In this photo taken Thursday May 26, 2016 Major Preston Lawrance walks by a new memorial at the Veterans Cemetery in Boscawen, N.H. The new memorial will be unveiled on Memorial Day honoring men and woman who have died fighting terror since 9/11. 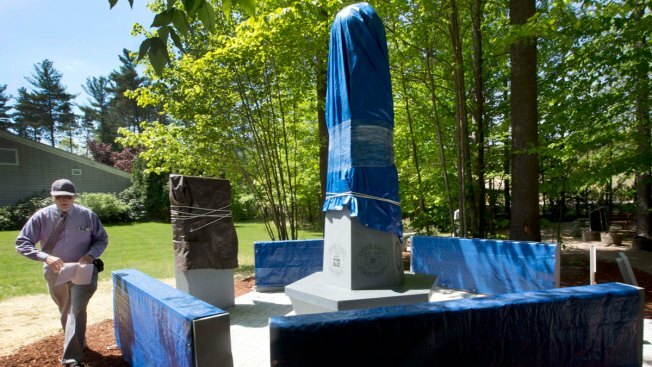 With dozens of family members looking on, New Hampshire has unveiled a monument to soldiers killed fighting in conflicts since 9/11. The 12-foot granite memorial is located at the New Hampshire State Veterans Cemetery in Boscawen. It was inspired by a similar monument in Vermont and is only the second of its kind in the nation. The memorial features four hero walls with the names of 50 state residents. It also has a globe on top and benches representing all five military branches, as well as a helmet, combat boots, dog tags and an inverted rifle - known as a field memorial. The monument was unveiled on Memorial Day. It was the idea of Preston Lawrance, who led efforts to raise the $100,000 to build it and recruit a designer.